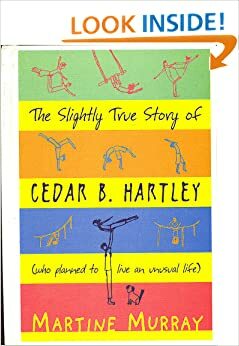 The Slightly True Story of Cedar B.Hartley: (Who Planned to Live an Unusual Life) by Martine Murray Book condition: Used; Good Book Description... ‘Molly and Pim is wild, whimsical and wonderful. It makes you fall in love with the world and everyone in it.’ Sally Rippin. Martine Murray, author of The Slightly True Story of Cedar B Hartley and How to Make a Bird, has written a delightful and magical story for young readers. Her novels, including THE SLIGHTLY TRUE STORY OF CEDAR B. HARTLEY, have won several awards in Australia. Her books have been translated into seventeen languages. She lives in Castlemaine, Australia, with her daughter and dog. Visit her at martinemurray.com. The Slightly True Story of Cedar B. Hartley by Martine Murray, 9781865086231, available at Book Depository with free delivery worldwide.